On Main Street, there are consumers with rock-solid jobs -- but also legions of debt-strapped individuals struggling to keep their noses above water. 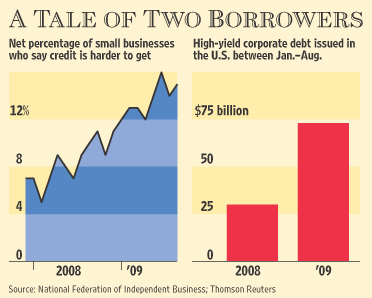 The split between companies that can borrow and those that can't shows the extent to which any recovery depends on reviving the nation's ailing banks and squeamish credit markets. Until that happens, the vigor of the economy will remain in doubt. "If you're not making money, you need to borrow money," says John Graham, a finance professor at Duke University's Fuqua School of Business. But "you need to be creditworthy in order to borrow, and if you're not making money, you're creditworthiness isn't very strong." Companies big enough to bypass banks and go directly to capital markets are finding a warmer reception. That's because the markets are showing more willingness to make risky loans: In January, only eight of the 56 companies that sold bonds were rated below-investment-grade, or "junk," according to Dealogic. In August, by contrast, 24 of the 60 deals had junk ratings. Since the start of the year, companies have been increasingly turning to the bond markets to raise money. Through August thus far, companies have issued $395.4 billion in bonds over 512 deals, according to Dealogic, a healthy increase from the second half of last year when the markets went months with fewer offerings and less than a handful of junk bond deals. In the business of finance itself, a divide between early winners and others appears to be opening up as well. Many of the nation's biggest financial institutions, benefiting from federal-government backing, have been able to raise equity and debt from private investors. Some large money-management companies such as BlackRock Inc. are profiting by helping the Treasury with the clean-up from the burst bubble. Big lenders are currently enjoying an advantage in their "cost of funds" -- the raw material of a bank, which is in the business of borrowing cheaply and lending at a higher rate. The handful of banks with more than $10 billion in assets were paying 1.18% to borrow money in the second quarter, the FDIC said in data issued Thursday. By contrast, banks with $100 million and $1 billion in assets were paying 1.97%, a big difference in a business where tenths of a percentage point translates into millions of dollars in profits. As of June 30 the three largest banks -- Bank of America, Wells Fargo, and J.P.Morgan -- collectively had $2.3 trillion in domestic deposits, or 31% of the industry total, according to the Federal Deposit Insurance Corp. Two years earlier, the top three had only 20% of the industry total. There is much more in the article including some winners and losers. Panera Bread, having no debt is a winner. Panera franchisees have a tougher go. And the biggest of big banks, Bank of America, Wells Fargo, and J.P.Morgan appear to be doing well thanks to bailouts and low costs of funds. Because those banks are regarded as "well capitalized" they pay a smaller insurance rate to the FDIC. "Regarded" is the key word. They can continue to be regarded as "well capitalized" but commercial real estate loans, credit card defaults, and pay option ARMs problems are the 800 pound gorillas in the room. When it comes to deposits, the big got bigger. Too big to fail is now "Too Bigger To Fail". However, as long as the corporate bond market holds together, equities will fetch a bid. How much longer that can last is anyone's guess. I suspect not much longer. The pool of greater fools is not unlimited. In the meantime ponder the key sentence in the article by Mr. Graham, who oversees a quarterly survey of CFOs "one in four [businesses] is in dire straits due to lack of profits combined with not being able to borrow." That is in addition to: Greater Than One in Four FDIC Insured Institutions are Unprofitable; Bank Problem List at 15 Year High. The best all this world record stimulus could do is create a bifurcated economy leaving one in four businesses and banks on the brink of disaster. Meanwhile there is no recovery in jobs, and no relief for cash strapped consumers. In due time this "recovery" is going to start flying apart.